The craft distillery boom has come to Texas in a big way. All across the state, entrepreneurs are trying their hands at everything from bourbon to brandy. Although some Texas distilleries are brand new and others have achieved national success, there are clear threads that unite them–hard work, commitment to a hand-crafted product, and desire to be the best at what they do. In addition to making great products, many Texas distilleries open their doors to share their process with local fans. Often, for less than the price of a cocktail, you can meet the owners and distillers to see first-hand everything that goes into making their wares, and you can try them, too. When it comes to alcohol, I fall somewhere between a total novice (in that I’m new to realizing I like dark spirits) and an aficionado (in that I like to drink). I am slowly but surely adding to my spirit knowledge in my trips around Texas, visiting as many distilleries as possible. Here’s a look at 10 great distilleries, each of which has its own unique character and flavorful offerings. Near the Texas-Oklahoma border in the small city of Denison, Texas, brothers Robert and Jonathan Likarish have added their Ironroot Republic Distillery to a list of experts in an area proud of its viticulture heritage. Opened in November 2014, the distillery is the city’s first, complimenting a growing number of wineries and breweries nearby. The first thing that struck me upon arriving at Ironroot Republic Distillery was the size. A former boat dealership, this 15,000-square-foot space houses the whole distillery operation, a large bar for enjoying the products, and a generous seating area. The space allows for multiple stills to produce the liquors, including a glass still dedicated to making the components of their gin. If I lived in Denison, I would probably spend way too much time here. 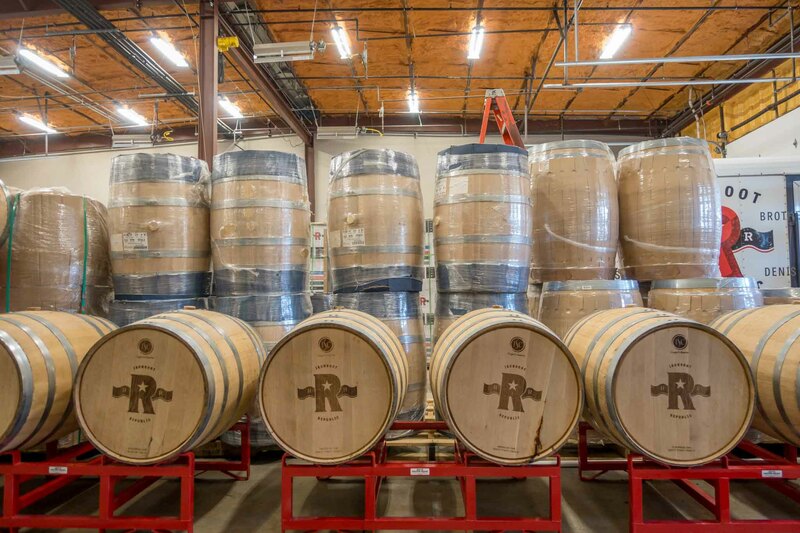 An area this large is helpful because Ironroot Republic prides itself on doing everything from scratch–their “grain-to-glass philosophy.” All the grain comes from within 60 miles, and they use non-GMO and organic ingredients whenever possible. The grains are mashed and fermented in-house before being distilled in the large stills that dominate the front room. The spirits age in various types of barrels in the back of the facility. During the aging process, Robert and Jonathan test each one every 4-6 weeks to ensure that the products are progressing as planned. When needed, they move the liquid to different barrels to draw out unique characteristics from the wood. You can get the full story during the tours they offer on Saturdays. And about that viticulture heritage… the name Ironroot pays homage to a local hero, of sorts. Thomas Volney Munson was a Denison resident whose knowledge of grapes is something we should all be grateful for. In the late 1800s, Munson developed a hybrid grape rootstock that was resistant to a fungus that had ravaged 80 percent of vines in France. After years of fighting the fungus, when the French grape-growers received the resistant rootstock from Texas, they were slowly able to rebuild the vineyards. Munson’s grapes are still grown at a local college as part of a program focused on the grape and wine industry. Ironroot Republic plans to use some of these grapes as they make new French-style brandies. Ironroot Republic Distillery has six products available now. Blue Norther Vodka is a smooth vodka with tropical notes followed by a caramel flavor. Carpenter’s Bluff Moonshine (named after a nearby bridge that carried moonshine across the Red River) has a taste similar to tequila, so it works well in margaritas and other cocktails that include citrus. Texas Drought Gin has the expected notes of juniper and citrus but with a hint of vanilla. Three whiskeys have been released since my visit to the distillery–Hubris (a corn whiskey) and Harbinger and Promethean (two varieties of bourbon whiskey). After the sneak preview I had from the barrels, I’m sure they live up to the awards they’ve won so far. Other liqueurs and brandies are also in the works. “If you like yours less than 100 proof, you just add water and go on with your sissy self!” he says to the laughing crowd. Quentin Witherspoon–the owner of Witherspoon Distillery and our slightly irreverent tour guide–is talking about the distillery’s straight bourbon whiskey. Despite its strength, I soon found out that the Texas bourbon (which smells like caramel and tastes like oaky vanilla and cinnamon) is so smooth that no water is necessary, even for a novice like me. 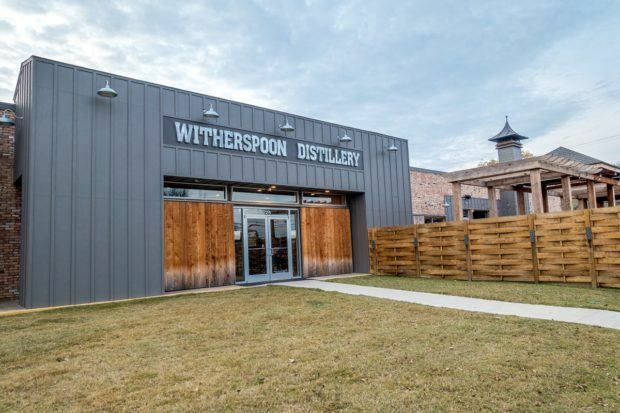 At least six times each weekend, Witherspoon gives these tours of his North Texas facility, walking visitors through the history of distilling and explaining how his products are made (before the delicious tasting, of course). His expertise as a master distiller is apparent since he’s steadily been honing his craft for 20 years. A former Marine, Witherspoon began distilling almost out of necessity when he was stationed in the Central African Republic (if necessity means a distinct lack of liquor) and gained further knowledge about whiskey in the South and rum in the Caribbean. Witherspoon’s skill is clearly punctuated with a sense of humor in his presentation and in the facility itself–the stills he and his father built are named Porgy and Bess, and he warns you to keep an eye out for the distillery’s cat, Mr. Waffles. In addition to the straight bourbon whiskey, Witherspoon Distillery makes three other core products. River Rum, Witherspoon’s original product, is a smooth white rum distilled from sugar cane and molasses. Its butterscotch and vanilla notes made me want to settle onto a beach somewhere in the Caribbean, rum cocktail in hand. Bonfire is a cinnamon-infused rum sure to warm you up on a cold day. During my visit, it was being featured in the “candied fire-apple cocktail” at the bar. Heaven in a glass. Witherspoon Distillery’s Single Malt Whiskey is their premium product. While not included in the tasting and distillery tour, it’s absolutely worth a few extra dollars for a taste. Earthy and delicate, this smooth liquor drinks like a scotch, and its complexity and sweetness develop in the glass. With or without a tour, you can hang out in Witherspoon’s huge bar and lounge or in their patio area on Fridays and Saturdays while trying one of their cocktails. There is often live music and a food truck, too. A visit here is a great addition to any weekend trip to Dallas. Turning under the 17th Street Bridge in Waco, Texas, you would never believe that you’re approaching one of the best craft distilleries in Texas (and likely the country). In a rusted, cramped 1880s welding shop, Balcones Distilling is turning out a portfolio of liquors that have won numerous accolades throughout the distilling industry. Started in 2008, Balcones Distilling was founded by two partners whose experience grew out of homebrewing. 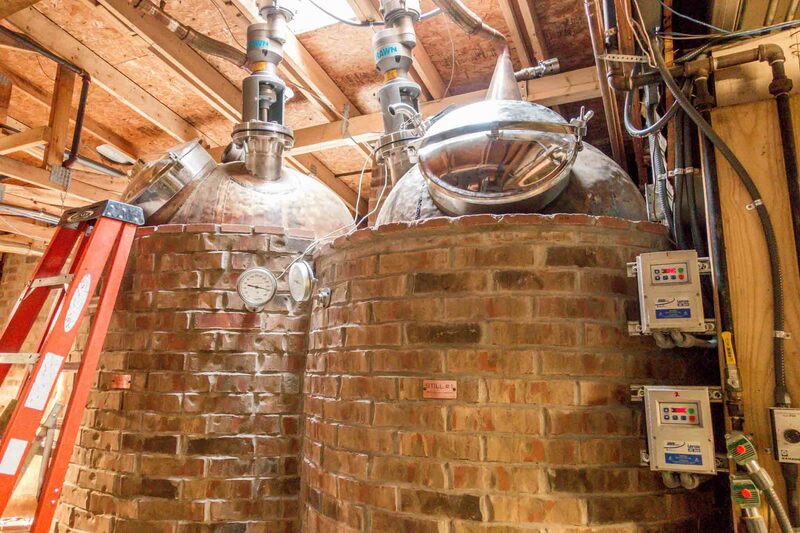 They plunged headlong into distilling, outfitting their entire 2000-square-foot space with equipment they made themselves, including condensers, stills, and heat exchangers. 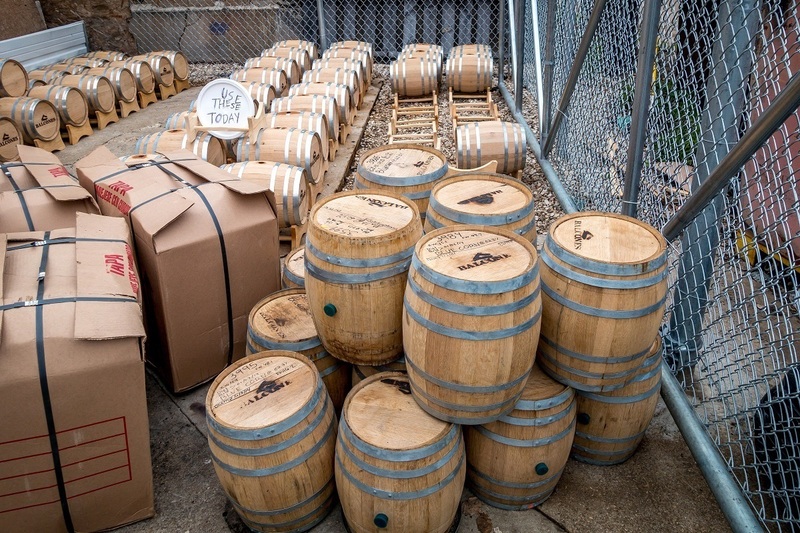 The same level of care and intensity they applied to the equipment is found in the hand-crafted product line of Balcones whiskeys (though they prefer the alternate spelling “whisky”) and other spirits. From the constant taste-testing and monitoring to the use of small barrels to impart more flavor to the spirits faster, every aspect of product development is carefully monitored. The careful crafting of remarkable spirits has led to an explosion in demand for Balcones Distilling’s products. On one of their tours, it’s easy to see that every inch of the relatively small space is being used and staff members fly from one task to the next. Until recently Balcones has only been able to meet a small percentage of the market demand. This is changing, though, as they have opened a new, much larger facility a few streets away in Waco (this facility–not the one on 17th street–is the current home of tours); it also features a tasting room. Balcones launched with two products–Rumble and True Blue. Rumble is an unclassified spirit made from all-Texas ingredients–honey, mission figs, and turbinado sugar. It has brandy and rum-like qualities, so although it doesn’t fit within either category, it’s as delicious as you would imagine with notes of honey, fruit, cinnamon, and spice. Baby Blue was the first Texas whiskey sold since Prohibition and the first blue corn whiskey made anywhere in the world, which helps explain why I’d never heard of a blue corn whiskey before my Balcones distillery tour. Made from 100% roasted Hopi blue corn, Baby Blue smells like buttered corn and had a slightly nutty taste. It was my favorite of the products I had a chance to taste at Balcones. Two other products available for tasting at the distillery are the Texas Single Malt Whisky and Brimstone, another type of corn whiskey. The flagship product of the Balcones Distilling franchise is its Texas Single Malt Whisky. This smooth spirit smells like banana bread and honey and tastes like toasted bread with a hint of spice and sweetness. The single malt is responsible for many of Balcones awards and helped propel the distillery to US and worldwide recognition. Brimstone, another 100% blue corn whiskey, undergoes a secret smoking process with Texas scrub oak after it is distilled. It has notes of wood smoke with a bit of corn and spice. 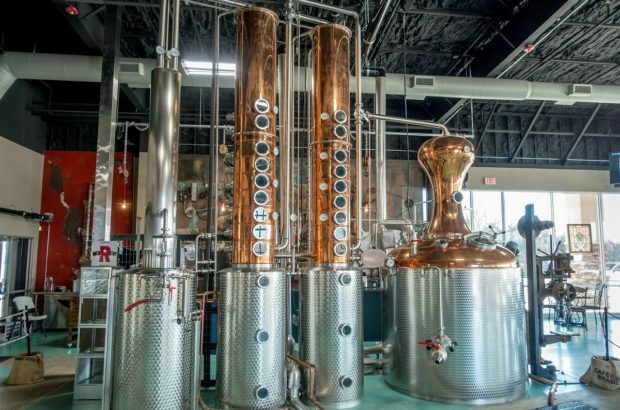 Schedule a tour of the new Balcones Distillery Tuesday through Saturday or stop by for a tasting or cocktail. The first whiskey distillery in Austin since Prohibition, Still Austin is about all things Texas. From the grains that go into its whiskeys to the botanicals for their rye gin, Still Austin stays true to its Lone Star roots in everything it does. Opened in September 2017, Still Austin is designed to showcase the craft of whiskey making, which is clear from the moment you step into the 10,000-square-foot space. Giant windows in the tasting room show everything happening on the distillery floor just a few feet away. As you sip on a selection of cocktails from the bar, you’re likely to see everything from grain bags being hauled around to the distillers carefully watching over every aspect of the fermentation and distillation process, making adjustments along the way. A tour of the distillery gives a view that’s even closer up. As I visited the facility, I learned about every part of the process that goes into making Still Austin’s whiskeys and gin. It begins before the grains are even purchased with Still Austin’s owners and distillers working with the farmers to select varieties that will impart specific qualities and flavors into the different kinds of whiskeys. Then there’s the fermentation process (in vats named after famous writers like Hunter S. Thompson), distilling in their 42-foot-tall column still (named Nancy), and aging. 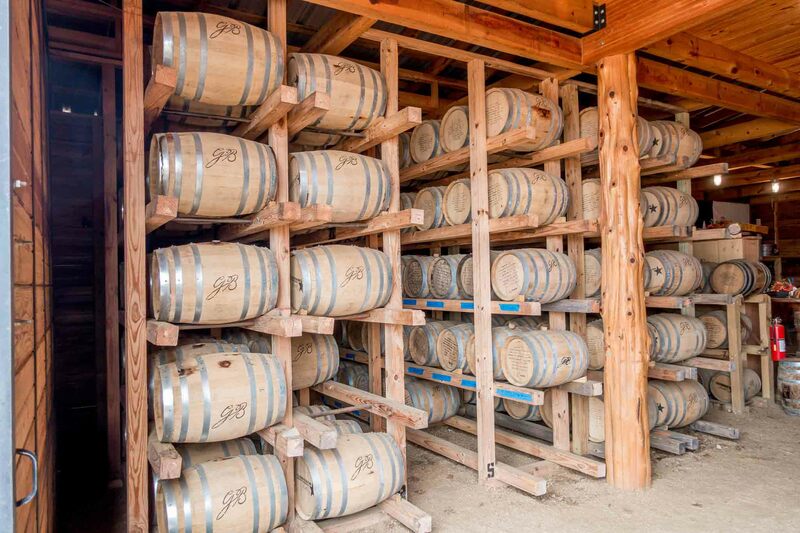 Fans who want to go beyond a tour can take part in whiskey making workshops, help with bottling, or even purchase their own barrel of aging bourbon. Still Austin Whiskey Co. has four products available now. Their New Make is a white whiskey that’s smooth enough to drink straight but also makes a great base for a cocktail. Mother Pepper includes three types of peppers and has a definite kick, perfect for lovers of Bloody Marys. Daydreamer is a refreshing, flavorful whiskey that includes three different kinds of citrus. It’s fruity, fabulous, and unique among white whiskeys. Their rye gin is flavored with juniper, coriander, elderflower, citrus, and other botanicals. All four are available for tasting or in cocktails in the tasting room. Still Austin is open for distillery tours and drinks Wednesday through Sunday. There is a food truck on the grounds, and there’s often live music. Deep Eddy Distillery, a hometown favorite, straddles the line between a craft distillery and a major corporation. Located just a half-hour outside the capital, it still heavily identifies with Austin but is now in liquor stores and bars everywhere, shipping millions of cases across the country each year. Still, its Dripping Springs home is the only place you can tour the distillery and have a cocktail made by the Deep Eddy bartenders. Even without a tour, the Deep Eddy tasting room is a fun place to visit. All the cocktails are designed to showcase the products—straight vodka, grapefruit, lemon, peach, orange, cranberry, and sweet tea—in traditional and unexpected ways, like combining multiple flavors of vodka into some killer drinks. My favorite was the Olio Twist, featuring the orange and ruby red grapefruit vodkas and a lemon oil shrub. The tasting room is open Thursday through Sunday. You can try a cocktail, visit the food truck, and enjoy the frequent live music and games on the hilltop patio. San Luis Spirits, the makers of Dripping Springs Vodka and Gin, are doing something unique among Texas distilleries—instead of making their products in one or two large stills, they use 15 handmade, 50-gallon copper stills to improve the taste of their spirits. 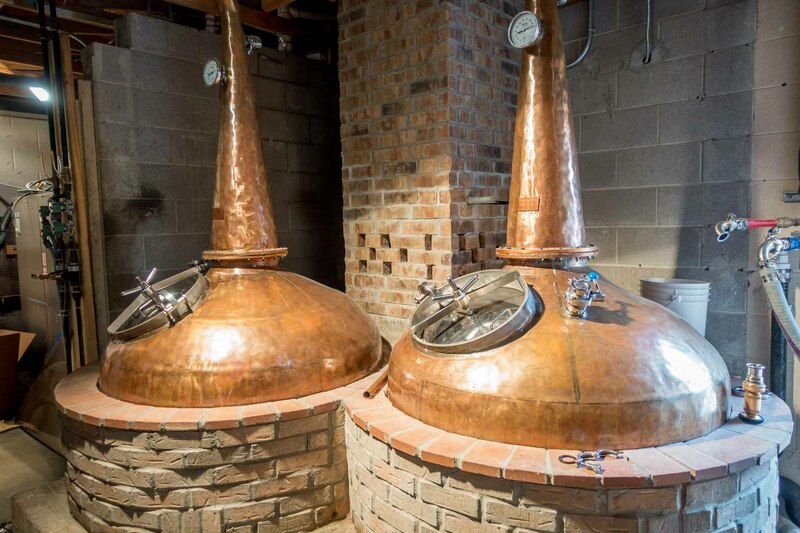 The stills require more work and attention than other types of equipment, but owners Kevin and Gary Kelleher feel the effort is worth it for their spirits. On a tour of the Dripping Springs distillery, you can see the distillation process in action. Throughout the building, there are batches of vodka and gin in various stages of readiness. Many are infusing with the different botanicals and fruits (zested by hand on-site) that go into the flavorful products. On a tour here, you’ll learn about all their products, most of which are made with mineral-rich artesian spring water from the Hill Country. The first distiller based in the Texas Hill Country, San Luis Spirits has been producing vodka since 2007 and gin since 2014. They add complexity to the product line by having multiple options of each spirit, which can be tried in their tasting room. Part of the Kellehers’ goal is to make affordable products, so they offer 1876 Vodka, a well vodka made with filtered water instead of the spring water used in the other products. It and the classic Dripping Springs Vodka are perfectly smooth when sampled straight. The Texas Orange vodka is an enhancement to the straight vodka, infused with oranges from the Rio Grande Valley. I expected a sweet product similar to triple sec but instead found a deliciously fruity spirit that works straight or in a cocktail. As much as I enjoyed the vodkas, the Dripping Springs gins were my favorites. They’re infused with nine botanicals, including lavender, cardamom, and orange. The Artisan Gin is a more floral product (which I love), and the Traditional Gin is a juniper-forward London gin. Stop by the San Luis Spirits distillery in Dripping Springs for a tasting Monday through Saturday or a tour Thursday through Saturday. 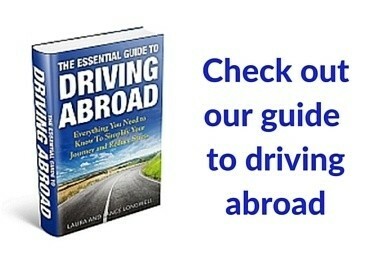 There are also frequent fun events like live music, trivia, and themed parties and competitions. 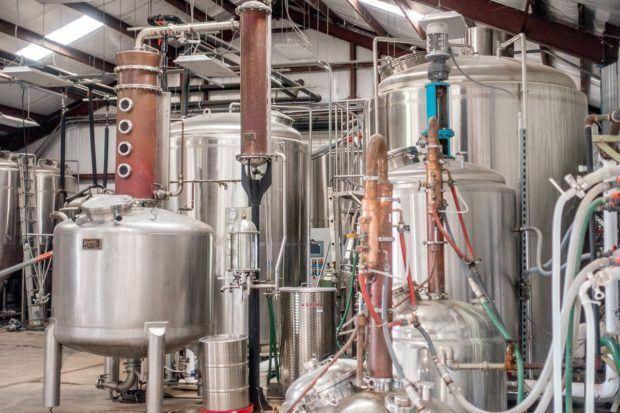 Treaty Oak Distilling is more than just a distillery–it’s one of the coolest places to visit near Austin. 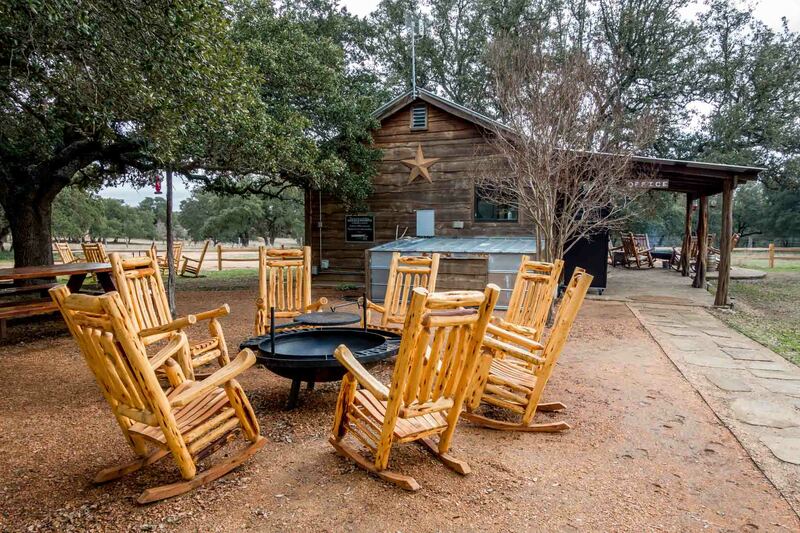 Located in Dripping Springs, Treaty Oak is a place to have great drinks, play games, listen to music, grab a bite to eat, and just hang out on a lovely Texas afternoon. In addition to all the beverage and food options, Treaty Oak is a family-friendly environment with games and picnic tables for everyone to enjoy. There’s also often live music and special events like cook offs, cocktail classes, and even farmers’ markets. Distilling for over a decade, Treaty Oak focuses on “the pursuit of the curious,” leading them to play with different methods and different products over their long history. They now focus on using Texas grain to produce their grain-to-glass whiskey, Ghost Hill Texas whiskey. They also sell Red Handed Bourbon and Red Handed Rye, two products made with outsourced whiskey while they continue making their own new takes on the spirit. In addition to whiskeys, Treaty Oak’s series of Waterloo gins include unique flavor profiles, including one aged in the tradition style of Dutch genever. Treaty Oak Distilling offers tours from 1-6pm on Saturdays, and the tasting room is open Thursday through Sunday afternoons and evenings. Several miles off the highway in the Texas Hill Country, an area known predominantly for its wine, stands one of the most well-recognized Texas distilleries, Garrison Brothers Distillery. 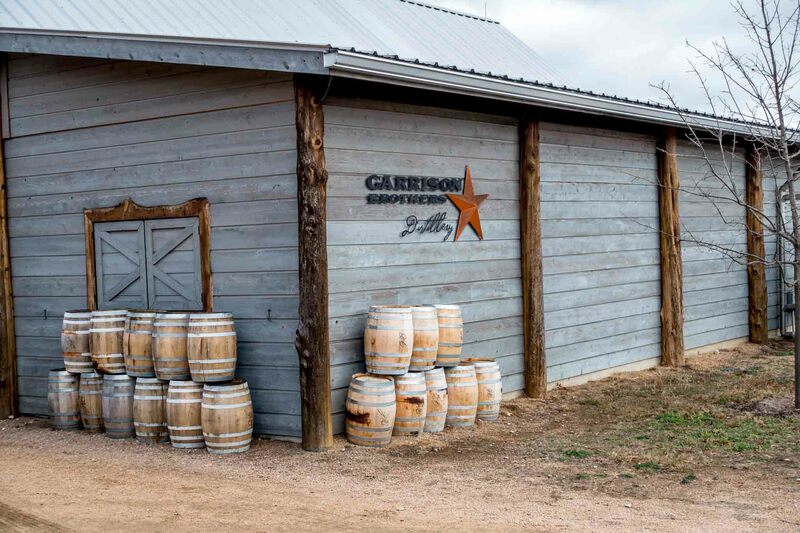 The first legal whiskey distillery in Texas, Garrison Brothers makes only bourbon, and they want it to be the best. Garrison Brothers has a strict “corn-to-cork” approach, which is outlined during the 20 distillery tours they give each week around the property. They do everything from making the mash to bottling the bourbon. 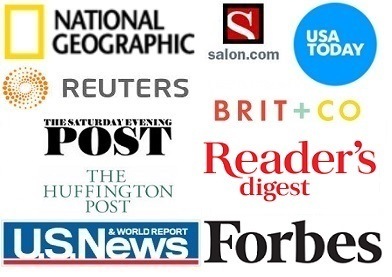 Their numerous awards show that the hands-on approach has definitely paid off. Making the Texas bourbon starts with all-organic, food quality grain–corn from the Panhandle, wheat they grow themselves on 65 acres in the Hill Country, and barley from the Pacific Northwest. After distillation in Garrison Brothers’ impressive copper stills, the spirits are aged for 30-40 months in charred white American oak barrels. 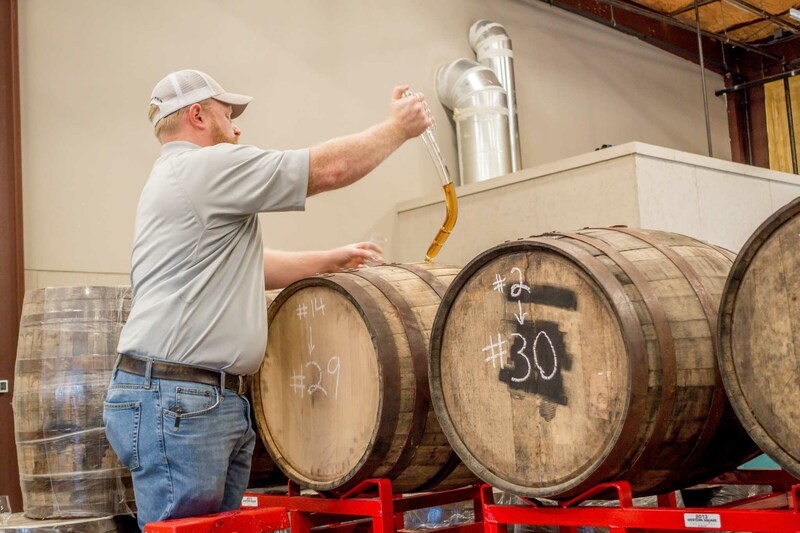 The pressure caused by the Texas heat requires that Garrison Brothers uses some smaller, thicker barrels than the typical bourbon barrels you might find in Kentucky, which could otherwise burst. After aging, the spirits are cut with rainwater. Pure Texas. Garrison Brothers currently has four products available. Their annual release of their Texas Straight Bourbon Whiskey is always aged at least 4 years. During my visit, I had an opportunity to try the Fall 2014 Vintage. Smelling and tasting of a combination of caramel and spiced fruit, I didn’t need to know much about whiskey to know this was fabulous. Garrison Brothers also makes Cowboy Bourbon, a cask-strength, limited release bourbon made from their favorite barrels, and Balmorhea, a double-barreled bourbon whiskey. Estacado is their straight bourbon whiskey that’s aged for three years in new white American oak and then finished in port wine casks. Innovation and partnership are the names of the game at Revolution Spirits. From its location to the ways the distillery makes its gins and liqueurs, Revolution goes beyond the things you might typically expect at a distillery. For starters, I found Revolution Spirits by accident when my sister and I were headed to Argus Cidery in the same complex. The popular Last Stand Brewing Company and a food truck round out the tasty offerings here and make for just about the best way I can think of to spend a Saturday afternoon. In the past, Revolution has partnered with Argus, turning wild fermented and barrel aged cider into an apple brandy. They’ve also worked with popular local brewery Jester King, using the fruit pulp from the brewery’s fruited farmhouse ales to create fruit liqueurs that are available for sampling at the distillery. Thanks to the unique combination of fruit and yeast, the liqueurs have a complex flavor unlike any other liqueurs I’ve tried before. Austin specialty purveyors Cuvee Coffee and SRSLY Chocolate contribute their products to Cafecito and Chocolate Cafecito, a fabulous coffee liquor and its coffee-and-chocolate cousin. Revolution Spirits’ flagship product is its Austin Reserve Gin. The floral spirit has flavors of juniper, rosemary, and Texas grapefruit, among others. You can try the straightforward version or something from the Single Barrel Series in which the gin is aged in different types of wood—on my visit, they were using whiskey barrels from Ironroot Distillery. The cocktail bar and tasting room is open Friday, Saturday, and Sunday afternoons, and tours of the production area are available by request during those hours. For Crystal Creek Distillery co-founders Shane Berber and Sam Wakefield, making moonshine is an all-consuming labor of love that requires more than a little elbow grease. The two-man operation makes a 1920-style moonshine, a clear whiskey that does not get aged in barrels, with all locally-sourced ingredients. Though the core components are simple–corn, sugar, honey, yeast and water–the process of arriving at the recipe was not. While testing the 110 versions of the recipe it ultimately required, the friends moved their operation to a local cave. 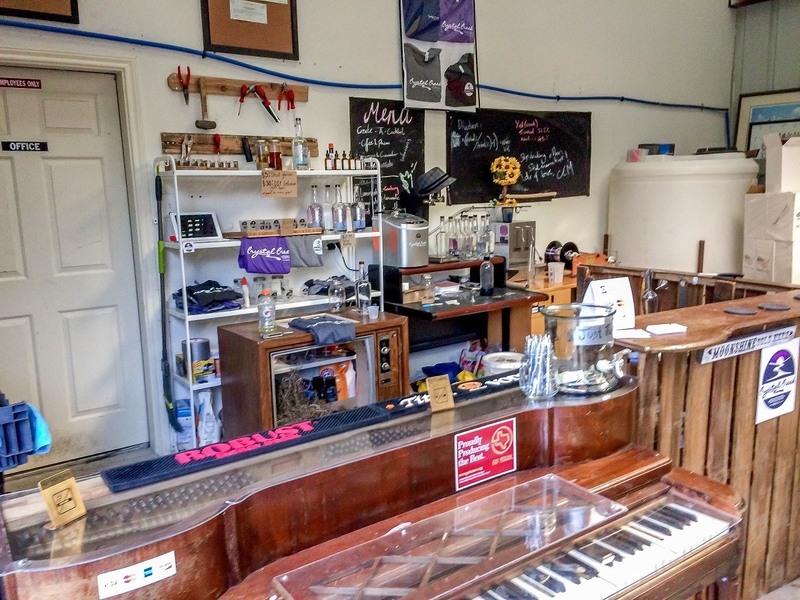 Now that they have a more hospitable space, they host tours and tastings four days a week in addition to periodic moonshine infusion workshops. The childhood friends often work around the clock in their warehouse space, sleeping in shifts when it’s time to distill. Most of the operation is contained in one large room, so they work together babysitting the moonshine, labeling bottles, and doing anything else that’s needed to bring their products to the public. But it’s not all serious–they encourage their customers to win prizes by posting pictures from the distillery or with the moonshine with the creative #MooningInPublic. 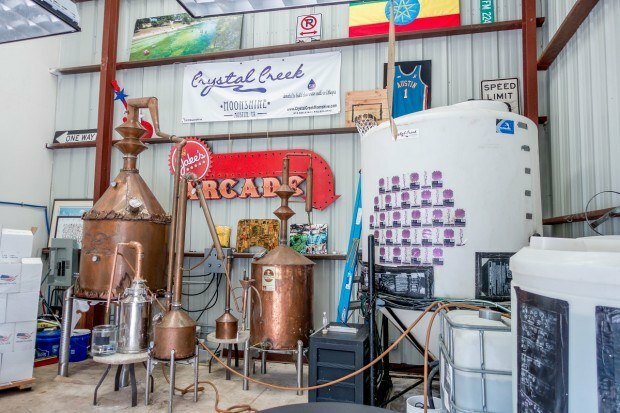 Crystal Creek Moonshine opened the doors to their distillery just outside Austin in late 2014. Since then, they have developed four varieties of the spirit. They sell a classic version but are particularly proud of their three infusion varieties–serrano and cucumber, blackberry and mint, and coffee and pecan. The first two flavors are subtle, with a hint of heat and bit of mint, respectively. The coffee and pecan infusion was my favorite, with a stronger flavor like an after-dinner liqueur without the sweetness. The moonshine can be consumed simply with tonic water or used as a mixer in cocktails, and the classic works particularly well with citrus flavors. Five percent of sales all sales go to building clean water wells in Ethiopia. Tastings and tours are available Wednesday through Sunday, and there are special events and live music many weekends. With the exceptions of Witherspoon Distillery, Deep Eddy, Treaty Oak, and Revolution Spirits, I was the guest of the Texas distilleries. Opinions about the liquid gold they are hand-crafting are my own. Have you been to these or any other distilleries in Texas? What did you think? 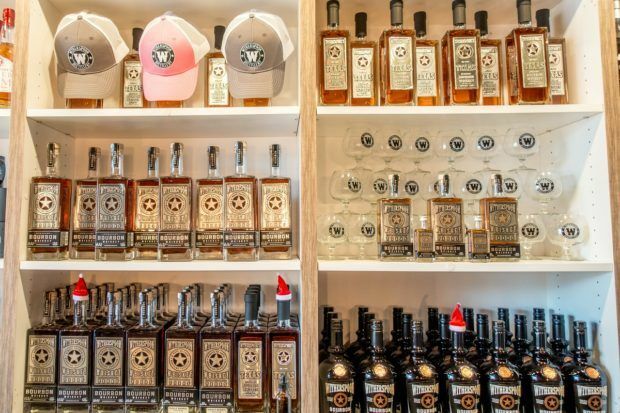 What do you think about 10 Great Texas Distilleries to Tour and Taste? Great article & pictures. Balcones, Garrison, and Ironroot are all grain to glass made in Texas, 100% of their products. This means they mash, ferment, distill, age, and bottle in Texas. Some others are not so honest. While they might distill some of their products, others are nothing more than sourced whiskey they purchased in bulk from out of state and bottled here. Thanks, Wade. It is true that buying neutral grain spirit (or something similar) from elsewhere and then re-distilling or bottling it is not an uncommon practice throughout the spirits industry as a whole. Many craft distillers certainly look down on it as being less “craft” than those who do a grain to glass approach. Sometimes it’s a purely economic decision, sometimes it’s because new distilleries haven’t had the time to age their own whiskey or bourbon yet, but they intend to. Based on what I’ve seen visiting 10+ craft distilleries over 3 states recently, I prefer the more holistic approach. However, I don’t think starting with a base product is inherently dishonest unless the distillery outright lies and says they start with mash. For a product like Gin where one may start with bulk GNS but then redistill with their own botanicals in a pot still, I would say that’s still craft. But when it comes to whiskey/bourbon, if you buy an already made product and it bottle it here, it’s not craft. At least one of the above companies you profiled in this article does exactly that with their ‘Texas’ bourbon. Actually, for certain types of whiskies including bourbon, doing so without stating where the whiskey was actually distilled on the label is a violation of a federal labeling laws. Look up 27 CFR 5.36 (d).